Manchester United have sounded out the entourage of Chelsea midfielder N’Golo Kante over a potential transfer to Old Trafford. The Red Devils are on the hunt for a top class signing in defensive midfield after a dip in form from Nemanja Matic this season and a lack of impact made by summer signing Fred in that department. 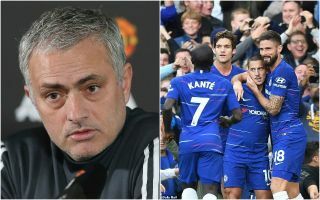 And CaughtOffside understands United have made Kante one of their top targets, in what would be an ambitious and audacious raid on their rivals. The France international is undoubtedly one of the very best players in the world in his position at the moment and has shown his quality in the Premier League with some big performances in the last few years. There seems little doubt Kante could be a perfect fit for what Jose Mourinho wants from his midfielders as well, and CaughtOffside understands initial contacts have been made to sound out if the former Leicester City man would be interested in the potential move. This follows some recent talk that Chelsea are keen to tie Kante down to a new contract, with Calciomercato citing L’Equipe as saying that is a priority for the Blues in the coming weeks. Meanwhile, the likes of Paris Saint-Germain and Real Madrid have also been linked with the 27-year-old by Le 10 Sport, so it may be that the player will end up prioritising a move abroad instead. CFC would undoubtedly rather not lose a player like Kante to a major Premier League rival, and will be reasonably confident of keeping hold of him for the moment, with his current contract not due to expire until 2021. Still, the longer they go on without tying Kante down to a new deal, the more clubs like United might feel they have a good chance of snapping him up.